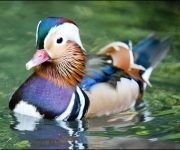 The Mandarin duck, or Mandarin, is a medium-sized perching duck, which originated in China. It is easily recognisable by the distinctive plumage of the male. The female has plain cryptic colouration  see image below, left. 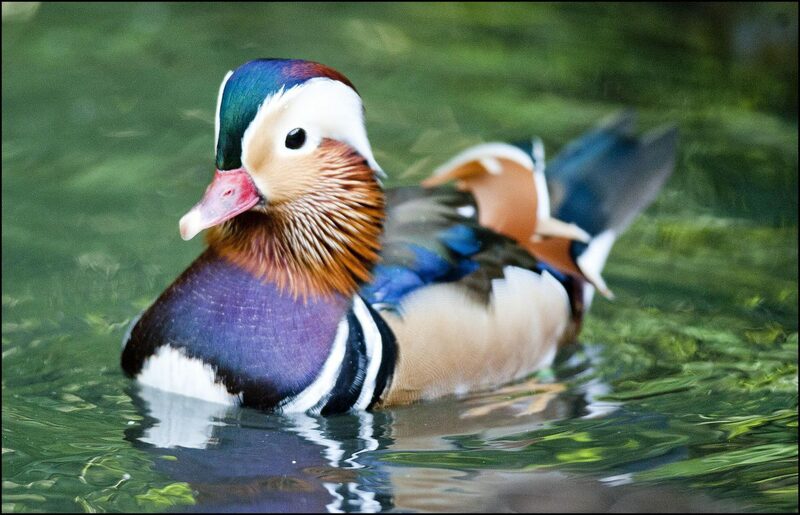 In the wild, Mandarins live in densely wooded areas near shallow lakes, marshes or ponds often in mountain regions. They feed mainly near dawn or dusk, perching in trees or on the ground during the day. The diet consists of seeds, acorns, grain, aquatic plants, insects, land snails and fish. Mandarins feed by dabbling or walking on land. Mandarins nest in cavities in trees close to water. 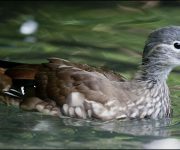 Mating takes place in the spring and afterwards the female lays 8-10 eggs which she incubates alone for some 30 days.The male takes no part in the incubation butdoes not completely abandon the female, leaving her only temporarily until the ducklings have hatched. Shortly after the ducklings hatch, their mother flies to the ground and coaxes the ducklings to leap from the nest. Amazingly, the chicks land unhurt despite the fact that nest cavities can be as high as 9 metres off the ground. They are then joined by the male who helps to protect the ducklings. Once a common and widespread species in eastern Asia, the population has declined in recent years and may now be under 10,000.